Memorial Day started early for a day off. My twelve year old boy scout reported to our neighborhood church at 7 to collect the flags he was responsible to post. When he and my husband, Jason, returned home we all headed to a cemetery about 30 minutes away. 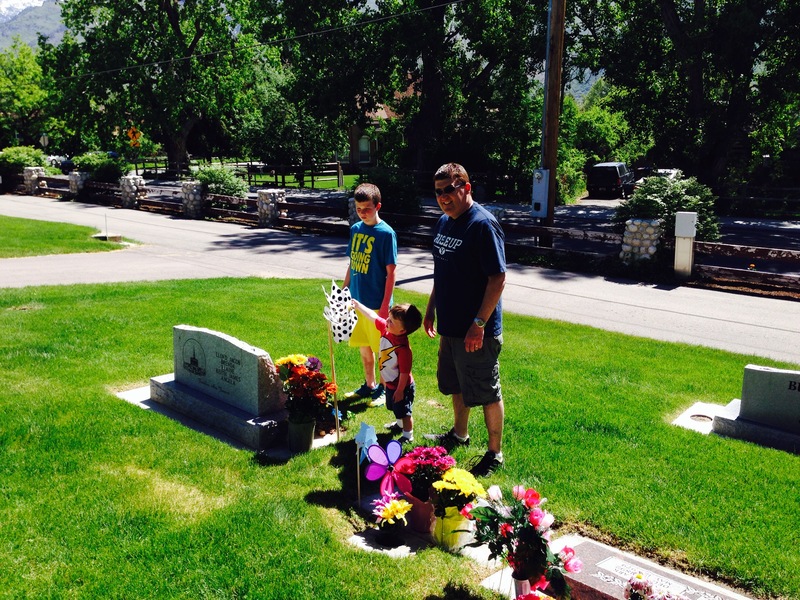 We chose the cemetery that Jason’s great grandparents are buried in. 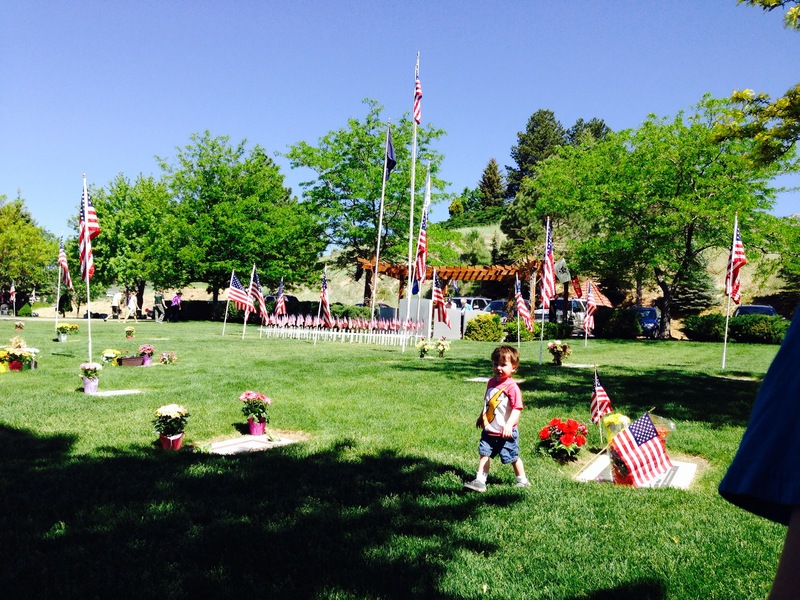 We had three objectives for our Memorial Day Cemetery adventure. Find Stephen Feramorz Beck & Maggie Elizabeth Orr Beck’s headstone. 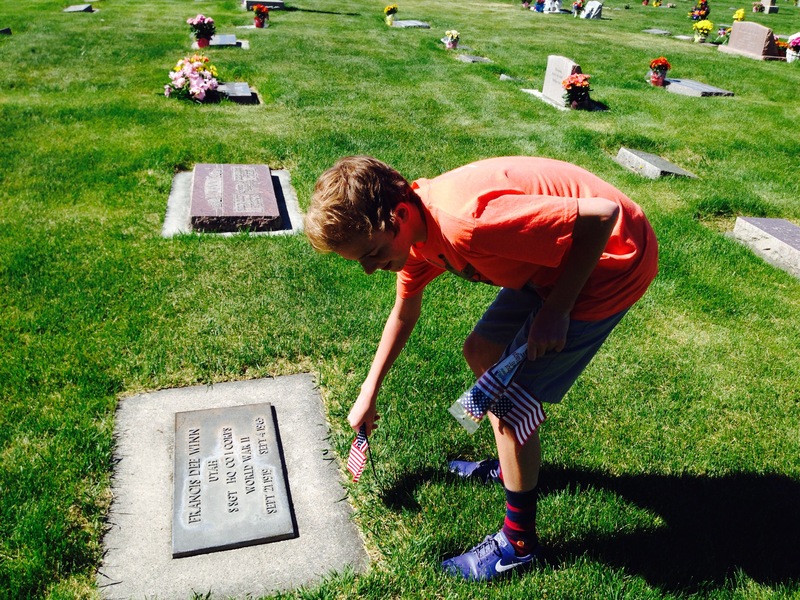 Help our children find graves of veterans so they could post small flags next to their headstones. Take some photos for findagrave. Objective 1 went well. Jason had tried in the past to find his great grandparent’s headstone without success. This time – we got it. Jason proud to have finally found his great grandparents! Objective 2 also went well. I had purchased packages of small flags and gave each of my big boys their own flags. 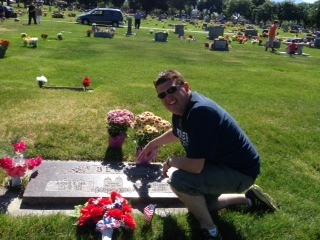 My instructions were simple – find graves for veterans and post a flag next to their headstone. This was the perfect task for a 16 and 12 year old. It kept them busy while we were in the cemetery. I was pleasantly surprised that during their task they started to pay more attention to the headstones in general. They were noticing things and pointing them out to each other and to me. After their flag supply was exhausted I would hear them say things like, ‘Oh, here’s another veteran. I’m out of flags.’ I have to say, it warmed this mother’s heart to see her own boys show love and appreciation for veterans they did not know and for others whose stories they were trying to piece together and imagine based on the minimal information found on a headstone. My 12 year old even came up with his own challenge – he wanted to find someone who shared his birthday. Finally as we were driving out of the cemetery he said, ‘Stop! I found one. Mom, will you take my picture by it?’ So sweet. My amazing oldest son honoring a WWII veteran. Objective 3 was interesting. I had mentioned here that I wanted to get involved in submitting photos to findagrave. I knew the cemetery we were visiting only had one photo request that had already been claimed. I thought I might just look for memorials that did not yet have photos. 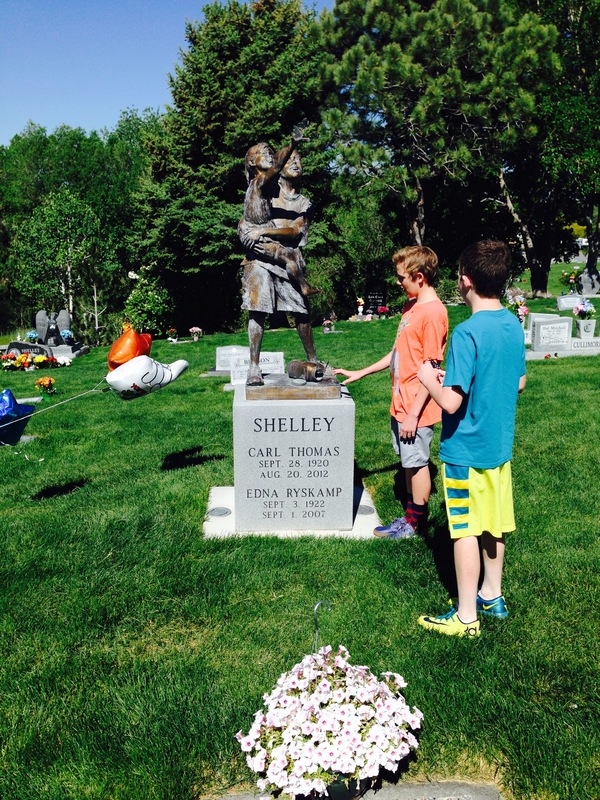 The trouble was, findagrave was WAY too slow for my fast moving pack of boys. At first I was trying to check memorials through the app but I was getting left in the dust by my family. So I just started taking photos of any headstone that had good light based on the way it was facing and the position of the sun. I took photos as we walked looking for Jason’s great grandparents and then on the way back to the car. I took about 20-25 photos. I was hopeful that a few of them were not yet on findagrave. One of my random clicks. 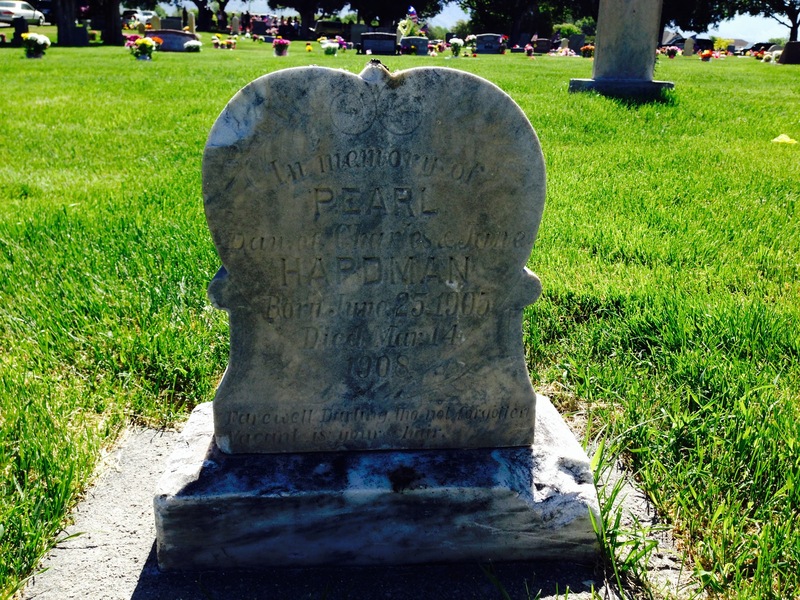 A headstone for Pearl Hapdman who did not yet have a memorial on findagrave. We went on to visit a second cemetery close by. My husband thought one of his relatives was buried there but we didn’t find him. Next year he wants to plan ahead a bit. Our visit to the cemeteries was lovely. In the first cemetery there was a traditional Scottish bagpiper playing in the shade of a tree in the center of the cemetery. There were plenty of visitors paying their respects. The flowers were lovely. The flag was everywhere. Pinwheels were spinning. It was such a wonderful morning. One of the more unique headstones. The pinwheels were a draw for our two year old. The Alpine Cemetery had a lovely display of small white crosses honoring deceased veterans from Alpine. Display is to the left of the pergola. Afterward we took our hungry fellas out for lunch. They chose a pizza buffet. A great reward for their support, show of respect, and good attitudes. 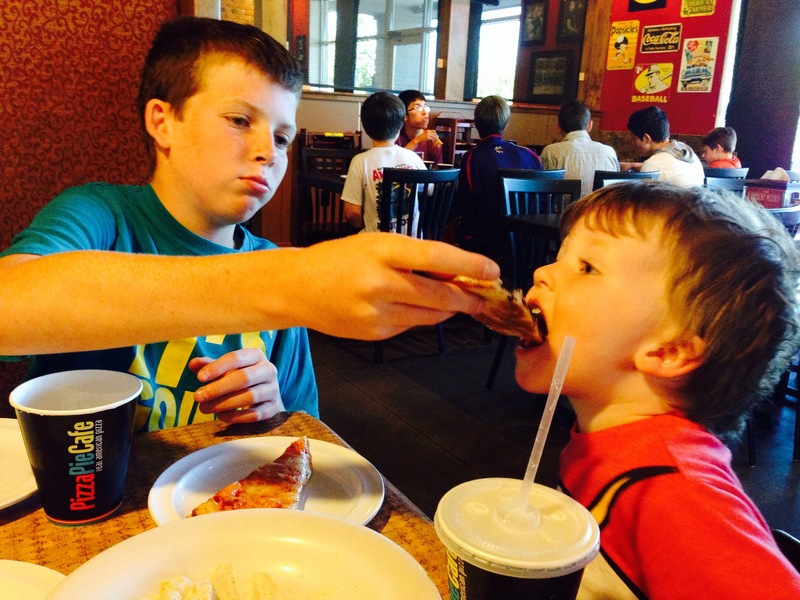 Oreo dessert pizza was a big hit for this little first timer to a pizza buffet. Thankfully big brother loves to share. Later in the day when everyone was having some down time I went through the photos I had taken. Of the 20-25 shots, 19 were not yet in findagrave. Of those 19 photos I found 13 graves that weren’t yet listed in the cemeteries. I created memorials for those and added all of the photos. While the random snapping approach wasn’t what I had in mind, it worked well for my family. We enjoyed our time together and I was able to focus on them instead of being sucked into the app trying to take photos for specific graves that didn’t yet have a photo. Instead, I clicked when it worked and still helped the findagrave website grow. We rounded out our day with some homemade hamburgers, fresh corn on the cob, potato chips and nectarines. Then we curled up and watched a movie. All in all it was a wonderful day. A balance of paying our respects and enjoying time together. A day of remembering and creating moments to remember. Truly, a day worthy of the name Memorial Day. Thanks Alex, it really was. That sounds brilliant. We don’t have anything like that in the UK. We do have Remembrance Day in November, which has lots of official ceremonies and things, but it doesn’t seem to have the same … family aspect (if that’s the right term) as Memorial Day does in America – or at least for your family! Plus November in England is not generally a time to be going out to cemeteries …! Thanks Dominic. November is probably not a great month for cemetery tromping with the whole family. Sounds cold, wet, and full of complaining to me. I think family aspect is a perfect term. Memorial Day is usually a family event no matter how it is celebrated. Some people just use it as a shopping day or a BBQ day but usually still with their family. What lovely memories for your boys and great teaching moments as well. Smart of you to change your photo taking plans as well. Because you were able to shift gears and not give up, you still accomplished your goals. So proud of your whole family! Thank you! Such a nice compliment. It was a pretty great day. What a great day. It made me feel good just reading about it. Thank you Charles! It was lovely. This is so awesome! It’s wonderful that you took your boys to the cemetery. And thank you for taking photos for Find A Grave. Thank you Jana! It was a really wonderful day. Have a lovely weekend. As a member of FindAGrave I want to personally thank you for your thoughtful efforts to take the photos and make the memorials. One day someone researching their family line just might connect to one of these memorials! The site is so great when it works with collaborative efforts and individual ones, too. It’s been a great resource for so many. Your family members are noble… and you went above and beyond on Memorial Day. 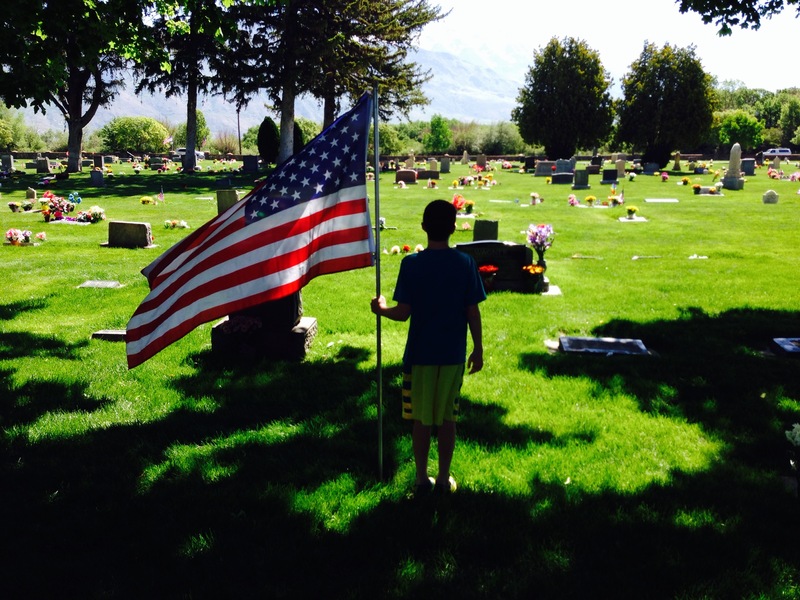 Incidentally, your photo of your middle child – with the backlit Old Glory – was perfect for this day or any other day. Thank you. Thank you for your kind words. It was really a pleasure to spend that time together doing something so meaningful. I thought that photo was pretty fabulous too, thank you and thank you for stopping by! What a wonderful way to spend Memorial Day! Thank you! It has been a lot of fun putting those together. It helps that I work with a great group!